As this Blog has noted before, one key reason families find financial security is because they work with an expert who helps them acquire financial products like life insurance, an IRA or an investment vehicle. The bottom line is that if we want more families to achieve financial security, we need to make sure they have access to experts who can help them do it. Studies show very few find financial freedom on their own. CFS has done a fair amount of work on how financial professionals are licensed and get into the business. We want to know why some communities are served by the industry while others are not. The CFS work has uncovered instances where the evidence suggests that state licensing requirements for financial professionals, particularly licensing exams, may be serving as an unfair and unnecessary barrier to entry into the profession. In other words, there are people who are trying to serve their neighbors but are not getting through the licensing process. While licensing is important and meant to protect consumers, consumers are not protected if the pool of professionals on which they can rely is artificially limited. We've noted before how evidence in Louisiana and Texas shows that those most likely to work in underserved communities are least likely to get a license from the state. While no one should ever get a license if they do not deserve one, CFS has asked states to make sure their process is fair. This week, there is better news from the Commonwealth of Virginia. Virginia was an early leader in the effort to look at exams and ways to encourage success from all those seeking to get a license. 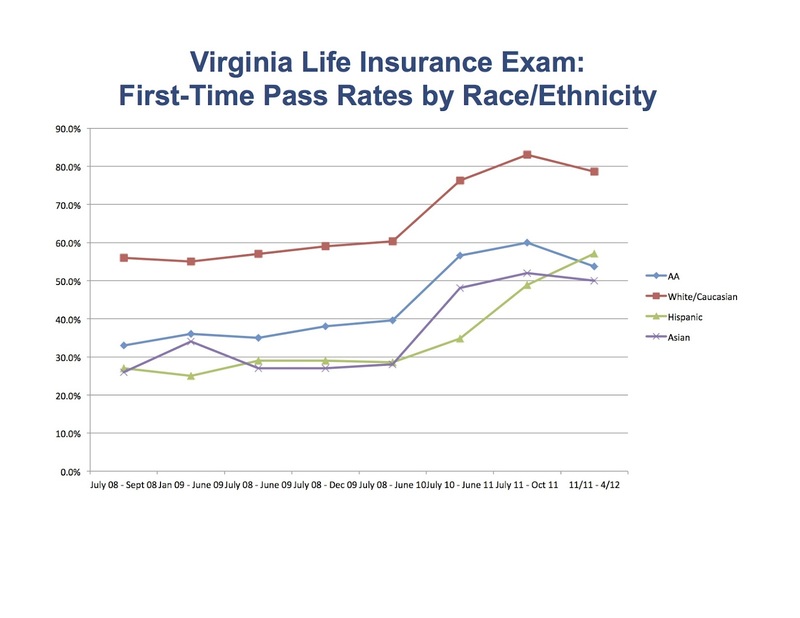 The new report in Virginia shows that when states make an effort to help license professionals from all communities, results can be dramatic. 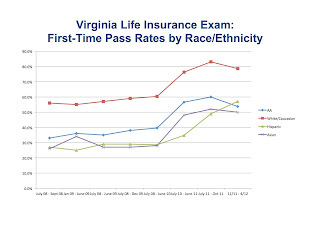 Take a look at pass rates for the Virginia life insurance exam over time. There has been a dramatic jump. In 2011, Virginia officials told the Wall Street Journal that they concluded that their exam was more difficult than necessary, and that the exam was improperly failing even those who had entry-level knowledge and should be getting a license. The Commonwealth took steps to "fix" its exam, and it would seem that everyone is benefitting today. The Virginia experience shows that states can help connect consumers with more financial professionals without sacrificing consumer protections. As a result of the work of regulators, there are now more agents in Virginia helping their neighbors acquire the tools that have become a necessary part of the American Dream. Congrats to Virginia. Let's hope other states follow.